Above: Carl Thompson with black walnut 8-string bass flanked by two views of a stunning 26 fret 4-string with a mahogany body, a maple neck and two Schaller pickups. Note ebony “half moon” insert at the neck/body joint and distinctive sculpted horns. During the mid 70’s, Stanley Clarke was the reigning king of bass guitar, and one of his showstoppers was a high-pitched soloing instrument, a piccolo bass, which looked like a bass but sounded very different (it was tuned an octave higher than a standard bass). Stanley’s unusual 4-string was the work of New York luthier Carl Thompson, a specialist in customer instruments ranging from a straight-ahead 4-strings to exotic fretless and double-neck models-and even some electric guitars. Today, 45-year-old Thompson still builds his basses by hand. They feature ornate scrolls on the body and ebony heel caps-trademarks of his craftsmanship. Thompson has constructed instruments for many of new York’s top jazz and studio bassists, as well as musicians around the country-Bob Cranshaw, Rick Laird, Russell George, Ben Brown, Ken Smith, Michael Howell, Anthony Jackson, Chris Brubeck, Gene Perla, Dave Moore, Craig Nelson, Herb Mickman, and Billy Christ, to name a few. He also specializes in repairs and modifications at his shop (Carl Thompson Guitars, 171 Court St., Brooklyn NY 11201), fixing and fine-tuning the instruments of many of the city’s top guitarists and bassists. He also sells his own brand of bass string. Stanley wanted his piccolo bass fretless, but without frets, the sound was weak, leading Carl to eventually add them. A few years after building the first piccolo, Thompson constructed another for Clarke, this time with a thinner neck and its scale reduced from 34′ to 32′. Since then, he has built a few more piccolo basses, primarily for studio musicians such as Nashville’s Craig Nelson, who has also purchased a fretted/fretless doubleneck standard bass from him. 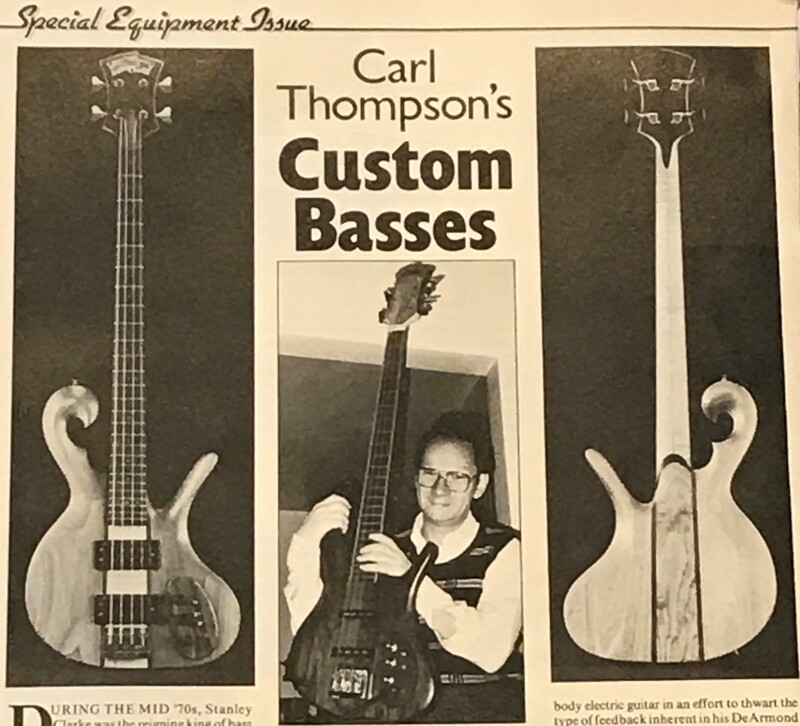 During his formative years as a luthier, Carl built a lot of unusual basses (developing a reputation for them along the way), including a 6-string for Anthony Jackson. His biggest problem was obtaining pickups because there were few companies specializing in custom units, which were needed in order to accommodate the wide string spacing. On the early 6-strings, he used a couple of Emmons steel guitar models that were essentially extra-wide standard guitar pickups. He made wooden covers and mounted the pickups in wood. He states, “The sound wasn’t perfect-obviously they were intended as guitar pickups-but they worked okay. Anthony understood their limitations.” Carl later built a fretless 6-string for Chris Brubeck, again with “make-do” pickups. Because the market for custom pickups has improved, Carl believes that his current basses are far superior, and says, “I’d like to put new pickups in those old basses to get their true sound.” Recently, Carl built a 36″-scale 6-string for a studio player named Dave Moore, employing Seymour Duncan custom pickups with bar polepieces. Thompson uses a 34″ scale for most basses, but he feels that the longer scale improves the intonation and enhances the overall sound, especially in the lower registers. 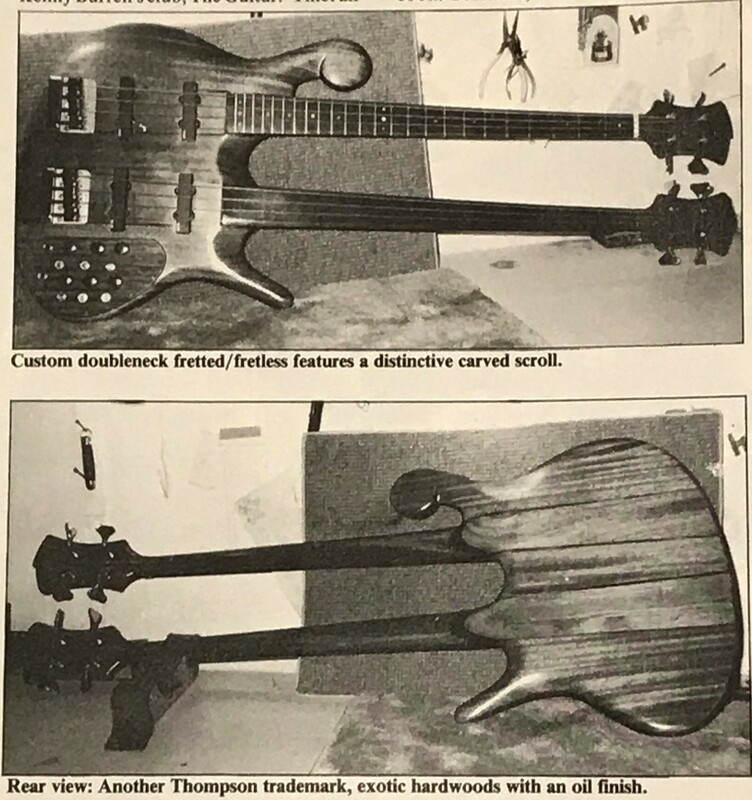 The bridges on Carl’s first few basses consisted of a single piece of ebony, so that the strings would stay in direct contact with the bridge and the bridge would be in direct contact with the body. By limiting the number of moving parts such as springs, screws, and saddles, he hoped to eliminate noises and other detrimental effects, which he feels are present in standard adjustable bridges. He still believes that kind of construction is a good idea, “providing the neck would never warp-ha!-and the player would use the same gauge of strings all the time-ha, ha!” However, since he has yet to meet a player who never changes string gauges or never takes the instrument outside or into humid environments, he uses adjustable bridges, including those by Badass and DiMarzio. Among other favored hardware are Schaller tuning machines and pickups by DiMarzio, Seymour Duncan, EMG, and Schaller, in any combination a customer chooses.